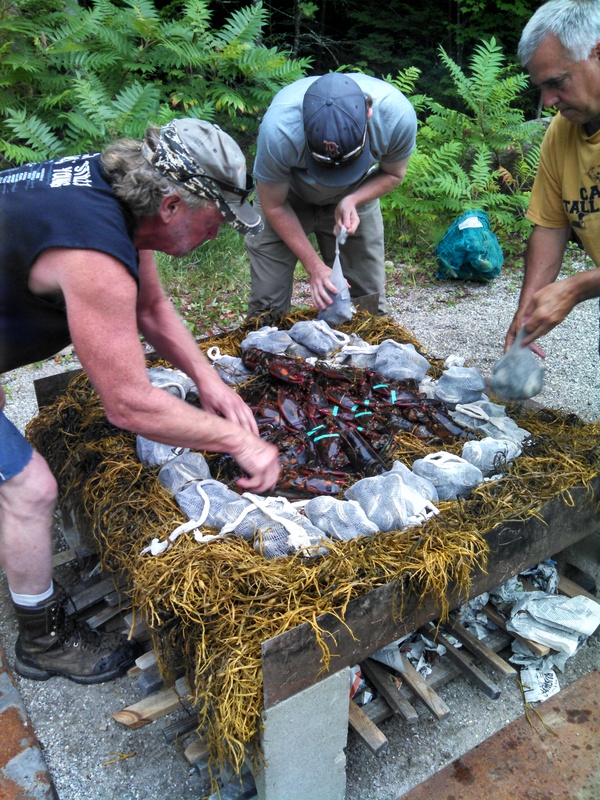 Maine is famous for it’s lobsters and summer is not considered complete here without at least one old fashioned lobster bake. 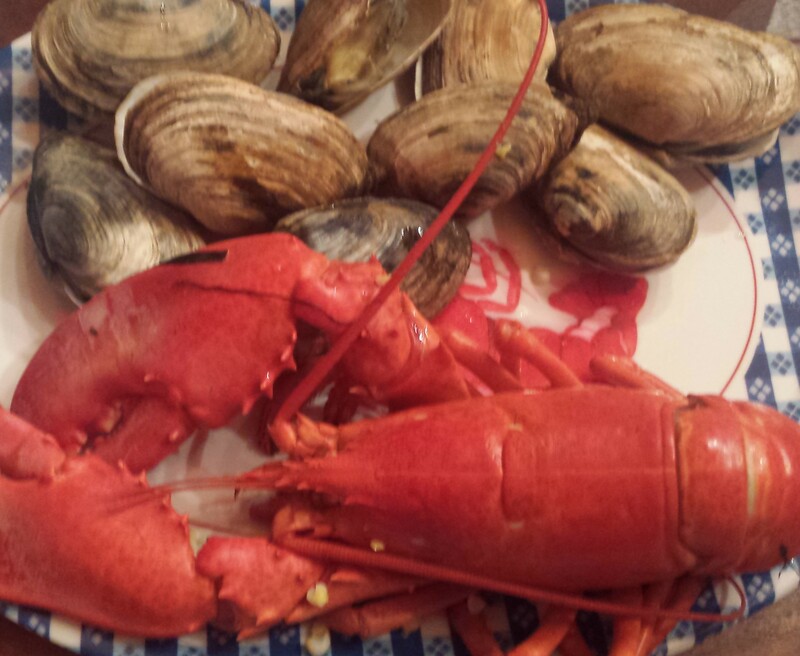 Traditional lobster dinners include lobster with drawn butter, corn on the cob and steamers (Ipswich clams) and sometimes potatoes or eggs, often served on these inexpensive, but iconic, blue platters that mimic retro diner tablecloths. I tried lobster for the first time on my first trip to Maine, way back when my husband and I were just dating. He went to summer camp in Maine as a kid and he has many fond memories (and good friends) and still loves to come here. I’m pretty sure he brought me up here all those years ago as a relationship test, which luckily I passed with flying colors. I learned how to eat lobster, waterskied in Bear Pond and slept on a cot in one of the old cabins, three actions which, I’m sure, made me marriage worthy. My three sons followed in their father’s footsteps and consider themselves Wigwammers to the core, first as campers, then as counselors. 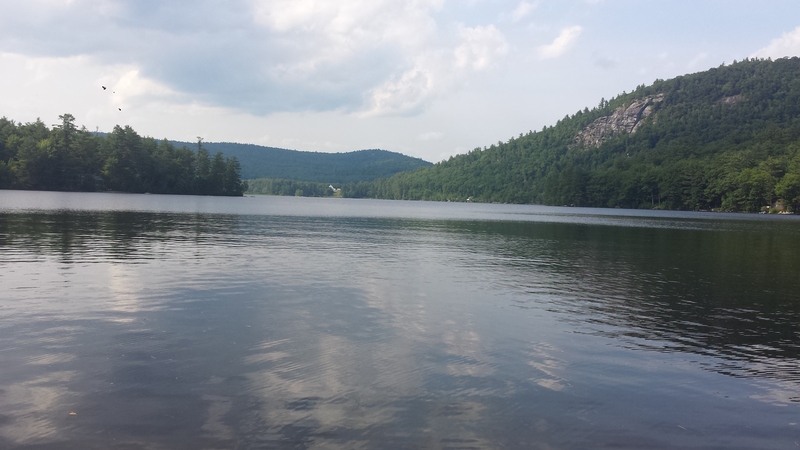 It’s no coincidence that we have a house across the lake from Camp Wigwam and come to Maine as often as possible. It’s a little slice of heaven on earth. 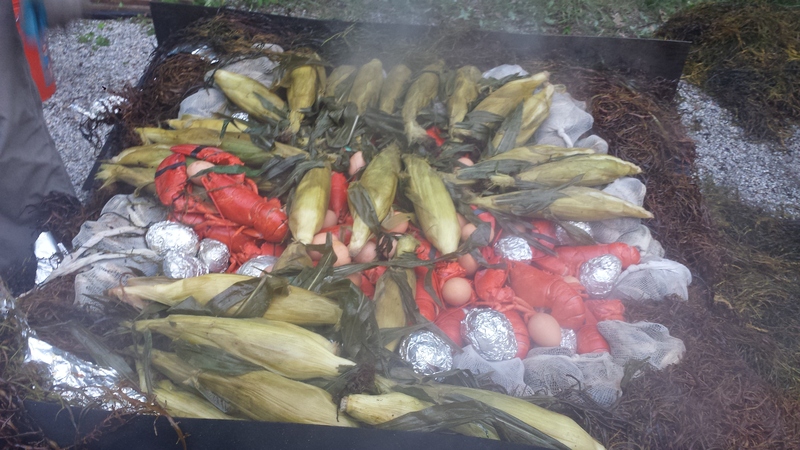 We were lucky enough to be invited to an authentic Maine Lobster Bake that was catered by our friend, Tom DeLois. He provided and prepared everything, freshly procured that morning, including the seaweed which they gathered by boat from the ocean. I was not involved in the preparations in any way, except for taking lots of pictures to document the process, which is simple but takes some effort. It’s also a great way to feed a large group in a casual but festive manner. 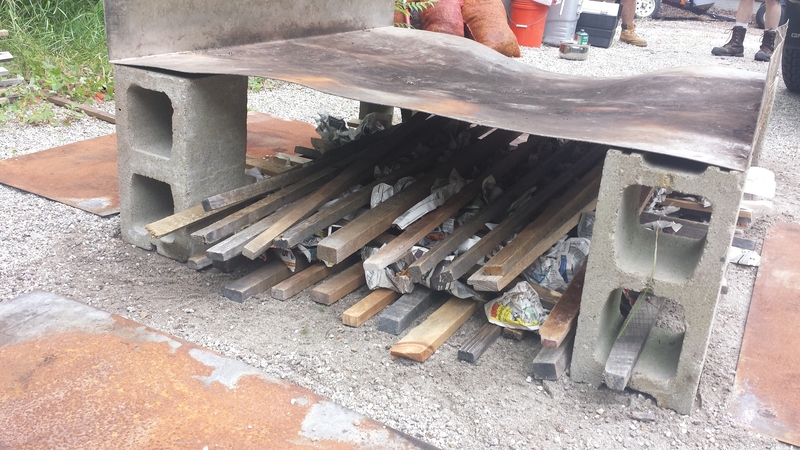 In an effort to minimize damage to the area, they cleared the gravel down to the bare dirt, then set up the cooking area with four concrete blocks and a metal tray. They stacked layers of wood and newspaper. The four metal sides(on the ground in the photo) are to block the wind if necessary. 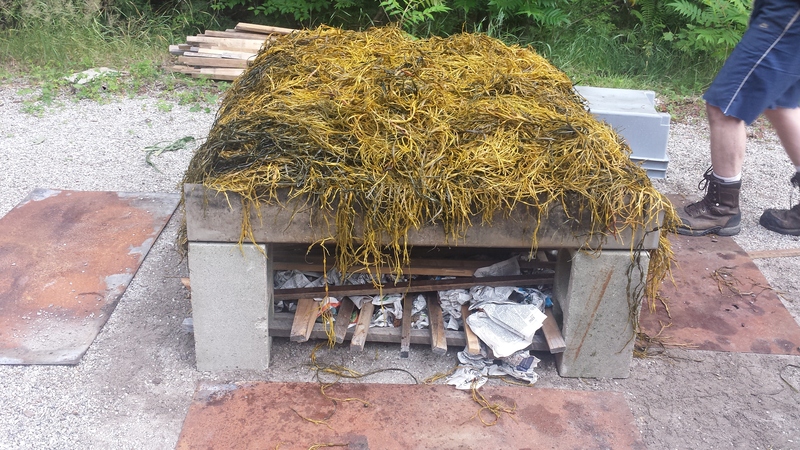 The first layer is wet seaweed which they collected themselves from the ocean. 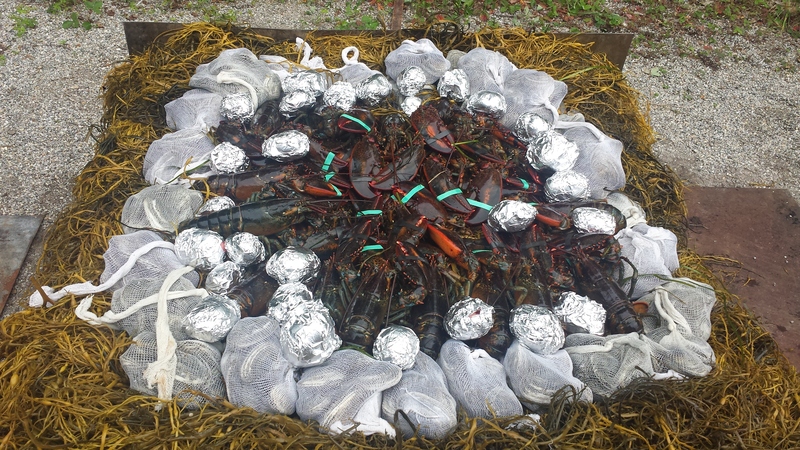 Next is bags of clams (steamers), lobsters and foil wrapped red skinned potatoes. 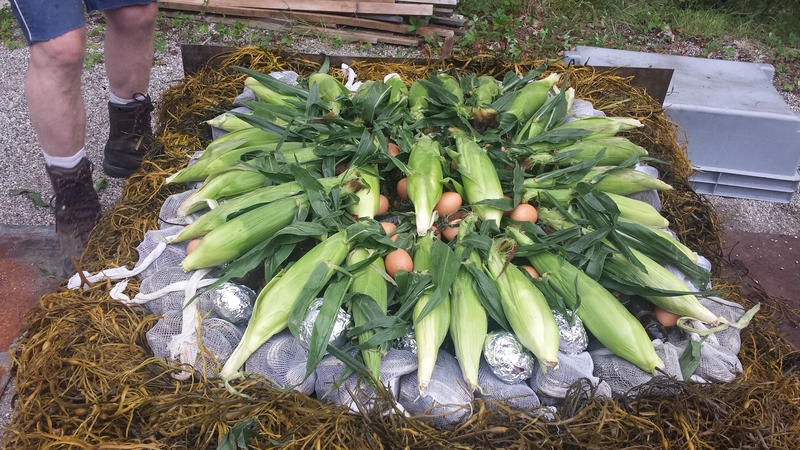 Topped with raw eggs and corn on the cob. 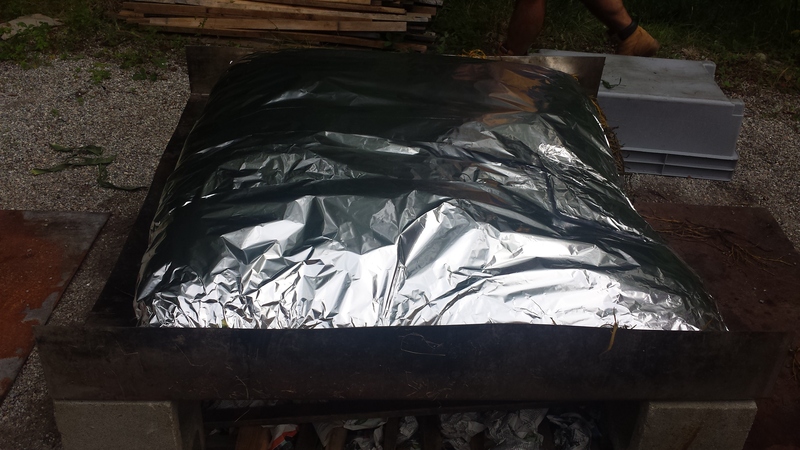 Wrap everything tightly with aluminum foil. Finish with another thick layer of wet seaweed. 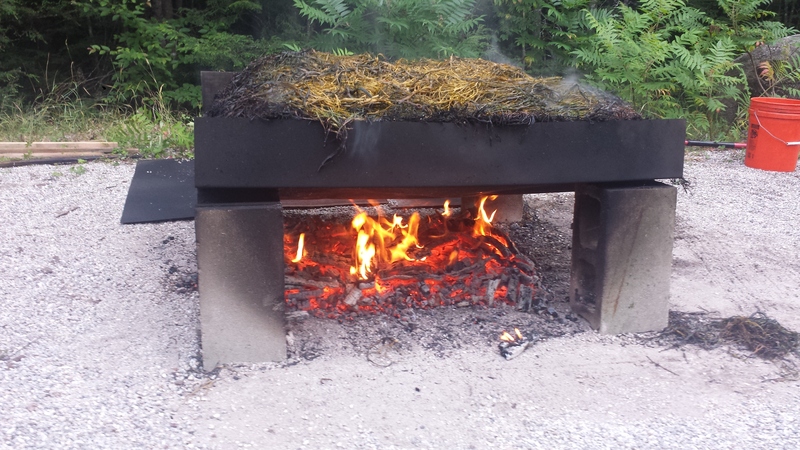 Light the fire and cook about 45 minutes. TIP: When the eggs are hard cooked, you know it’s done. 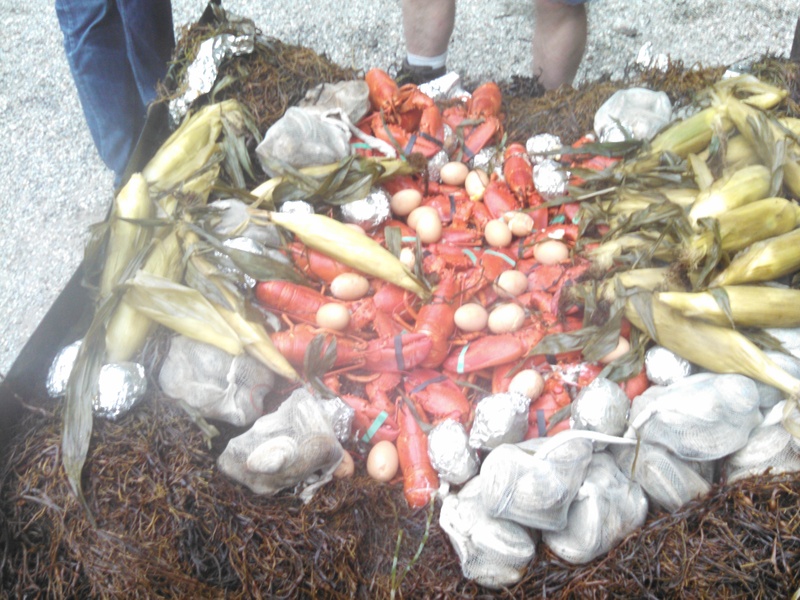 One of the nice things about a traditional lobster bake is the leftovers! 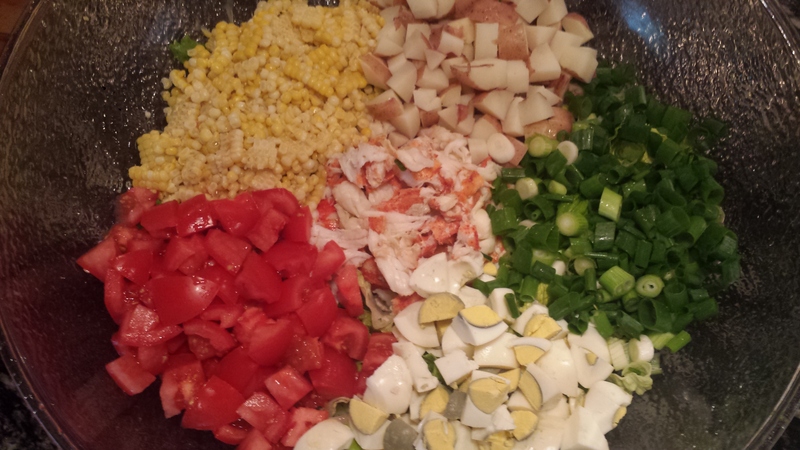 The next day I made a composed salad with the remaining lobster, eggs, potatoes and corn cut off the cob. I added some chopped tomatoes and scallions and arranged it all on a bed of fresh romaine. 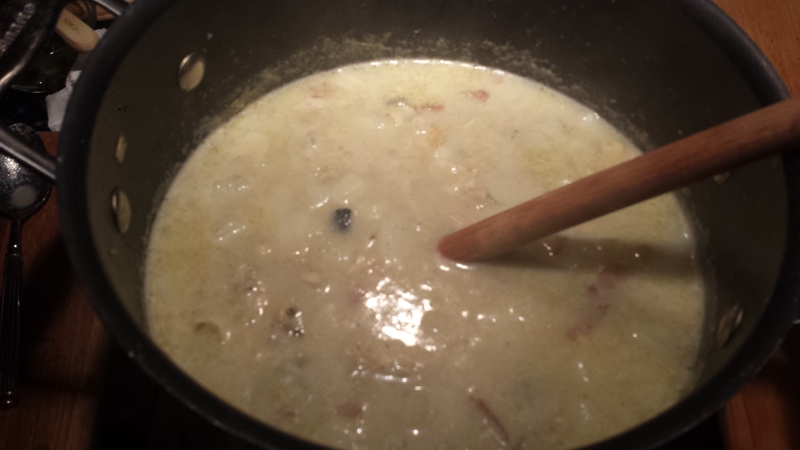 I also made a big pot of clam chowder with the leftover clams and potatoes. I sautéed a couple of chopped onions and garlic in butter, then added chopped potatoes, vegetable broth and milk and cooked it all for an hour or so until it’s slightly thickened. Add the clams toward the end and cook another 20 minutes or so on low heat. Don’t let it boil or the clams will get touch and chewy, like rubber bands. Season with salt and pepper. Enjoy! 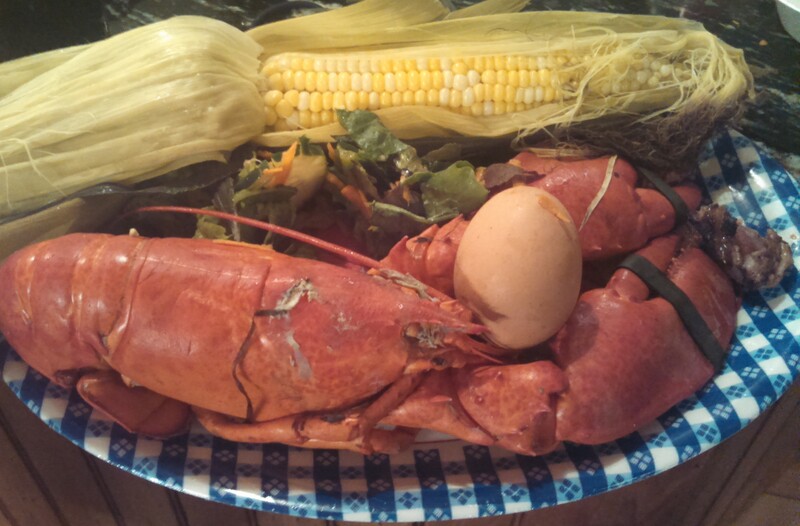 This entry was posted in All Recipes, Pescetarian, Wheatless Wednesday and tagged corn on the cob, gluten free, grilled potatoes, lobster, lobster bake, Maine, Maine Lobster Bake, Maine Lobster, Pescetarian, steamed clams, steamers, Wheat Free, Wheatless Wednesday. Bookmark the permalink.